Applications for space at 2013 SEMA Show are available at www.SEMAShow.com/buyabooth. The Show is set for November 5-8, 2013, in Las Vegas . . . A 60th Anniversary Gala on Friday, March 1, kicks-off the Petersen Museum’s two-day celebration of the Corvette’s 60th Anniversary. The evening of cocktails, dinner, and live memorabilia auction will feature iconic speakers, including Kirk Bennion, lead designer of the Corvette C7 Stingray. Register a Corvette and buy tickets online at www.corvetteday.org or call (323) 964-6325. Another gala and inauguration will be held in the nation’s capital on March 12 when WAPA stages its 24th annual gala. The John Lynker Golden Gear Award will be presented and new WAPA president Melanie Batenchuk will be inaugurated at the National Press Club event. . . . Peter Brock was presented the annual Road Racing Drivers Club’s Hill Award for outstanding service to road racing. Deemed. “A true motorsports Renaissance Man – a designer, author, team owner and photojournalist,” Brock has achieved and contributed to motorsports in each of those fields. 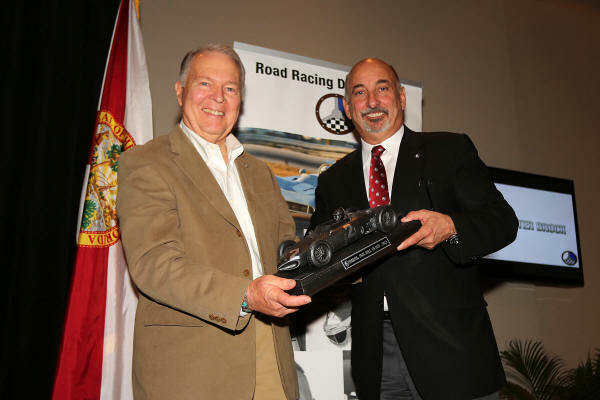 RRDC president Bobby Rahal presented the award to Brock . . . . The RRDC also honored Miles Collier with the Bobby Akim award given to a driver who best exemplifies the extraordinary qualities and characteristics that Akin represented, including a passion for motorsports and automobiles, a high level of sportsmanship and fair play, and who has contributed to the sport of motor racing. Volkswagen enthusiasts are offered a “Magical Mystery Funfest” in the cornfields of central Illinois, courtesy of Mid-America Motorworks from May 31 through June 2. It is the 15th fun fest for air-cooled VW fans. Advance registration and more information are available at www.funfestacvw.com or by calling 800–500-1500.